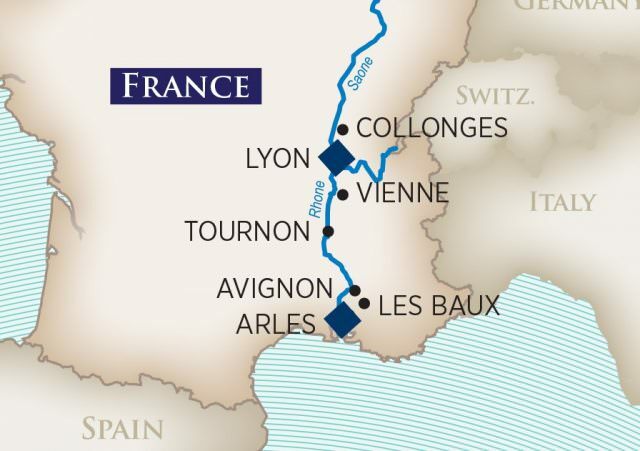 April 20-27, 2017, I will cruise along the Rhône river through France’s legendary wine growing regions. The region is home to such famous vintages as Beaujolais and Côte du Rhône, and I’m sure we’ll sample plenty of wine. We’ll enjoy wine tastings at local vintners, marvel at ancient Roman ruins, stroll through medieval villages and shop for Provencal crafts. Our itinerary includes the UNESCO World Heritage Site of Avignon as well as Arles, the city where Vincent Van Gogh spent much of his life. Follow our voyages on River Cruise Advisor, @rivercruiser, Facebook and Instagram. Here’s a description of the itinerary from AmaWaterways’ website. Today, you will visit Fourvière Hill, part of the city’s historic region that is now a designated UNESCO World Heritage Site. After some free time to see Notre Dame Basilica and take in majestic views of Lyon, you will join a panoramic tour that will take you past the Place Bellecour with its equestrian statue of Louis XIV, Place des Terreaux with Bartholdi’s Fountain and the Town Hall. Later, enjoy a walking tour of Old Lyon. The afternoon is free to enjoy however you wish. This morning’s tour will take you through the enchanting Beaujolais wine region, also known as the Pays d’Or or “land of the golden stones,” named for the richly colored limestone used to build local homes and castles. You will visit the medieval hilltop village of Oingt as well as the home of a local vintner who will invite you for a wine tasting and vineyard tour as he shares the history of the region’s wine production. Return to the ship in the afternoon and continue cruising towards Vienne. Upon arrival, make the most of your free time and venture about on your own or simply unwind on board. Situated between the wine regions of Burgundy and Beaujolais, Vienne’s Roman past can be seen in its marvelously preserved ruins. This morning, choose from one of three options to explore Vienne this morning. Your first option is to take a walking tour and see an ancient Roman temple, the ruins of a Roman theater, and the medieval Abbey Church of St. Pierre, today an Archaeological Museum. Your second option is a guided bike tour along a portion of the ViaRhôna bike route. Your third option is a guided hike from the ship up to the Monastery at Mount Pipet and back. Your ship departs at midday for Tournon. You have one of three options in which to enjoy your morning in Tournon. Your first option is an exciting ride in a panoramic train car as you discover the magnificent landscape carved along the Gorge du Doux. After riding through the gorge, you will stop at the charming little station of Colombier le Vieux-Saint Barthélemy le Plain, where you can watch the train maneuver in preparation for its return journey. Your second option is a visit to Le Chateau de Tournon for a very special presentation and tasting with a local expert on the paring of red wine and chocolate. Your third option is a hike followed by a wine tasting in the village of Tain Hermitage. This morning, you’ll have a choice of one of three different activities. Your first option is to travel by motor coach to Avignon, site of the bridge made famous by the French children’s song “On the Bridge of Avignon.” Seven popes once resided in the magnificent Papal Palace, which you will visit during your walking tour. You will also see the well-preserved medieval walls surrounding the historic center of town, a UNESCO World Heritage Site. Your second option is to take an excursion to the impressive Pont du Gard, a Roman aqueduct that is a masterpiece of ancient engineering and a UNESCO World Heritage Site. Your third option is a Provencal cooking lesson with a local chef where you will learn how to prepare a savory local dish. Later, enjoy an excursion to Grignan, a hilltop village surrounded by lavender fields. The village’s Renaissance castle provides a commanding view of the surrounding countryside. Afterwards, you will visit a truffle farm and learn about truffle harvesting. This morning, you will arrive in Arles and board a motor coach for an excursion to the village of Les Baux de Provence. The village’s castle has a fascinating exhibit of medieval weapons. Later, visit an olive farm to learn about this age-old Provençal farming tradition. Alternatively, take the Artist Experience tour to the the Carrières de Lumières, a stone quarry that projects artwork on its walls, and then Saint Paul de Mausole Asylum, where Van Gogh once lived and painted such well-known works as The Irises and Starry Night. Later this afternoon, you have your choice between a city tour of Arles that will show you the city’s top sights, including the Romanesque cathedral and Roman amphitheater, or a guided bike tour through to the Roman ruins. The ship moors overnight in Arles. Disembark your ship in Arles.